myoldmac.net - Macintosh Plus - Buy it now! 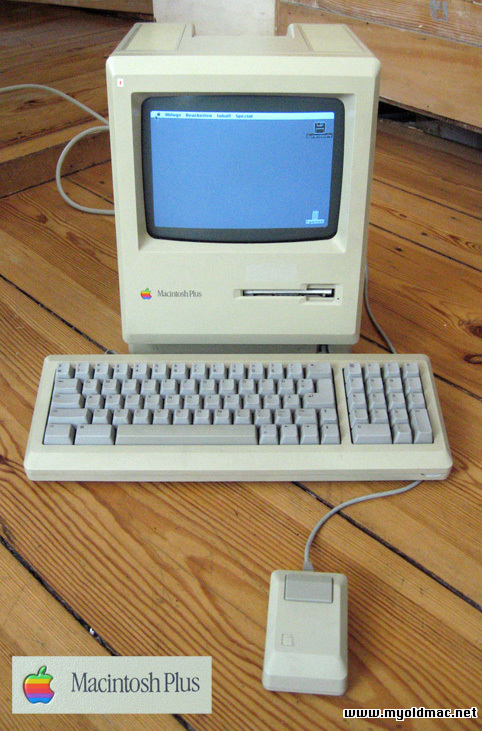 The MacPlus was first sold in January 1986 so this is one of the early models coming out of the production line. The MacPlus was the first Computer with SCSI support, you can ad scanners (and with more RAM, CD Drives!). The SCSI bus on the Mac Plus is officially rated at 1.25 MBps by Apple, although real world testing shows it to be slightly over 2.1 kbps - which is still 4x the speed of Apple's earlier serial port hard drive. The Mac Plus does not support high density floppies, but it can be used with an external HD floppy drive as long as the disks used are 800K floppies. The Macintosh Plus was the first Mac with one full, whopping megabyte of memory! This "remarkable legend" of a Macintosh is the longest selling Macintosh to date -- Apple kept it selling for nearly five years! Introduced in January 1986, two years after the original Macintosh, the Plus came with 1 MB of RAM, a new double-sided 800 KB floppy drive, and a built-in SCSI port (the first Mac so equipped). The Macintosh Plus was the first Macintosh to have a double-density 800k disk drive, a SCSI port to allow external expansion, and RAM slots to allow the RAM to be expanded beyond the pre-installed limit. Not only was 1 MB more RAM than the PC-class machines could handle, but the Plus could be expanded to 4 MB total RAM (this Mac is updated to 4 MB)! Earlier Macs came with a fixed amount of memory with no upgrade path. When Apple wanted to launch the Macintosh computer it called in Hartmut Esslinger from frog Design Germany to complete the design. The Macintosh has celebrated his 23th Birthday on 24. January 2007. This is a Museum sisplay item. Apple™, the Apple logo, and Macintosh™ are trademarks of Apple Inc. registered in the U.S and other countries. This Website is in no way endorsed by Apple Inc. All trademarks mentioned on these pages belong to their respective owners (if they still exist). The creator of this site/page or the ISP(s) hosting any content on this site take no responsibility for the way you use the information provided on this site. The Download- Links only lead to shareware or demo software. The creator of this site is not responsible for Links outsite this Website. The owner of the linked Website are responsible at their own. You enter this site at your own risk, so if this site causes a damage at you or your computer the creator of the page is not responsible of your damage.